SAN JOSE, Calif. — March 30, 2016 — /BackupReview.info/ — Dataguise, a technology leader in secure business execution, today announced Dataguise DgSecure 6.0, the newest release of the data-centric security platform that enables businesses to take complete ownership of sensitive data across all source types within the enterprise, including big data platforms, relational databases, and structured and unstructured data repositories. 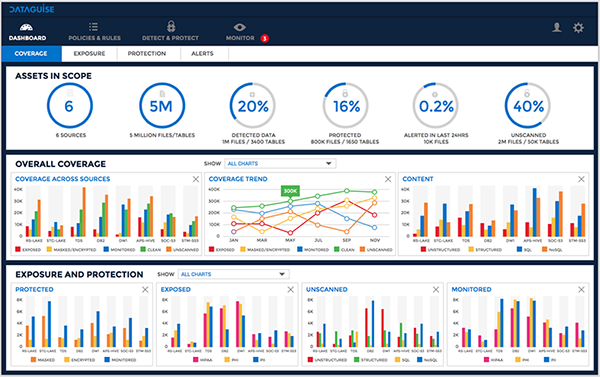 DgSecure 6.0 delivers the industry’s first comprehensive, visual dashboard to quickly understand what, where, and how sensitive data is being detected, protected, and monitored across the enterprise, both on premise and in the cloud, for streamlined sensitive data governance, privacy compliance, and risk mitigation. According to a recent survey by the Ponemon Institute, lack of understanding over where sensitive or confidential data is located is the biggest worry to IT practitioners. This concern has increased significantly from an earlier study where IT administrators also expressed uneasiness over the potential exposure of sensitive data. Unfortunately, most organizations do not have a common process for assessing the risks to sensitive or confidential data. Dataguise DgSecure 6.0 introduces the industry’s first dashboard for comprehensive visualization of all sensitive data throughout the enterprise—including government-protected PII, PHI, and PCI data, as well as other data elements deemed sensitive or confidential to the organization. Status of current sensitive data throughout an organization with data processing across all sources, including Hadoop, SQL and NoSQL data repositories. With this dashboard, users can see in one glance where all sensitive assets reside and how much of this data has been protected by masking, encryption, ACL, and alert policies. “There are primarily two things to do with big data: monetize and protect. And both are equally important. No matter what else we do with big data, security and monetization almost always are also in the mix. Even if we are talking about platforms, and algorithms that we use to analyze big data, we are still talking about security when using cloud computing applications or monetization when describing the purpose of the analysis. Even if we talk about storing the data on the cloud, we are actually talking about being able to store and retrieve that data securely, and being able to perform access control and audits on it,” said experts at Data Science Central. Dataguise invites attendees at this year’s Strata + Hadoop World in San Jose, March 29-31, to visit the company’s booth (#1608) to learn more about DgSecure, which will be made available in Q2/2016 and priced starting at $2,000 per node. *A trademark or tradename of an entity other than Dataguise, Inc.